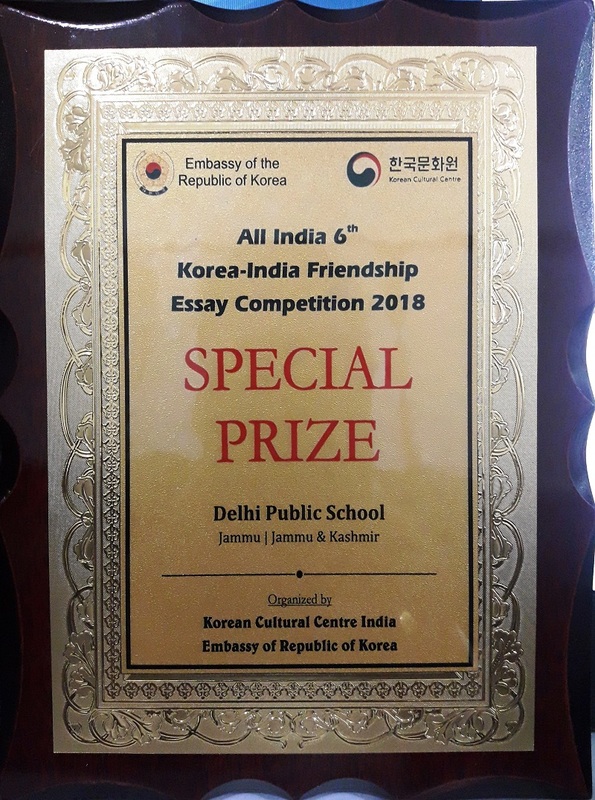 Students of Delhi Public School, Jammu brought laurels to the school and their parents by winning Certificate of Honour for participating in All India 6th Korea-India Friendship Competition-2018 organized by Korean Cultural Centre, Embassy of the Republic of Korea. A Special Appreciation Trophy was also awarded to the school. Thousands of students from all over India participated in the said competition out of which 139 students from DPS Jammu also took part. The competition was organized with the aim to raise the students’ awareness and interest in the geographical, political and general knowledge of the world, and also to increase the understanding of students over international & national matters of concern. It was conducted in two categories: Junior group (Class VII to IX) and senior group (Class X to XII). The students participated whole heartedly and enthusiastically and presented highly crafted out ideas. Principal, DPS Jammu, Ms. Ruchi Chabra applauded the literary effort of the students and said that such competitions add to the students’ academic profile and enhance their exposure in National & International arena. Hon’ble President, RCT, Sh. M.K Ajatshatru Singh Ji, Hon’ble PVC, Kunwrani Ritu Singh Ji and Hon’ble Director, Sh. S.S Sodhi Ji extended their best wishes to the participants and their parents.